There are so many great recipes for baking apples into sweets, but what about a savory apple dish to satisfy fall dinner cravings? 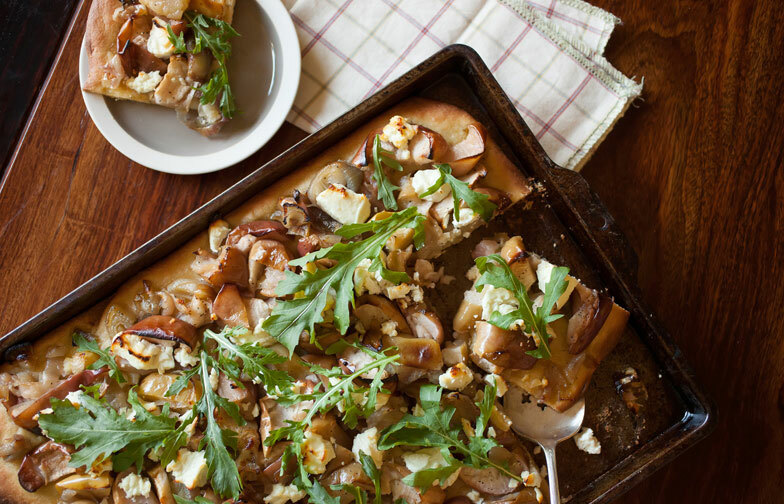 The apple, goat cheese and shallot combination creates a depth of flavors while the softness of the toppings pairs well with the cornmeal crust texture and peppery arugula. In another large bowl, whisk together flour, cornmeal and 2 tsp salt. Stir in yeast mixture and 1/3 cup of the olive oil until combined. If dough is dry, add a little more water. Knead dough gently until smooth and elastic, 7 to 10 minutes. Or, knead in a mixer or food processor fit with the dough blade for 3 to 5 minutes. Transfer to a lightly oiled bowl and cover loosely with plastic wrap. Allow to rest at room temperature until dough has doubled in volume, about 1 hour. While dough rises, heat oven to 425 degrees. In a large bowl, toss together apples, shallots, 1/3 cup oil, 1 teaspoon salt and the black pepper. Spread onto two large baking sheets. Roast, tossing occasionally, until mixture is tender and golden, about 30 minutes. Increase oven temperature to 450 degrees. Lightly oil a large rimmed baking sheet. Punch down dough and transfer to baking sheet. Using your fingers, roll or stretch dough to make an even layer. Scatter apple-shallot mixture over crust. Scatter goat cheese on top. Drizzle with oil and season with flaky sea salt and black pepper. Bake until crust is golden brown and cheese is just melted, 17 to 25 minutes. Cool slightly, top with arugula and sunflower seeds (optional) then cut into squares and serve.